However, fast food chains like Subway, Baja Fresh, and Chipotle have all changed the meaning of fast food. Such fast food chains serve healthy low calorie and high protein breakfast, lunch and dinner. With the nutritional data printed on the packets, fast food is fast catching up with bodybuilders as well. Be it kids, teens, men, women or even seniors, everyone loves to indulge in unhealthy fast food. The food serves you in many ways – it saves your time, money and the energy to prepare food at home. The good thing about fast food is that, the makers are getting health conscious. 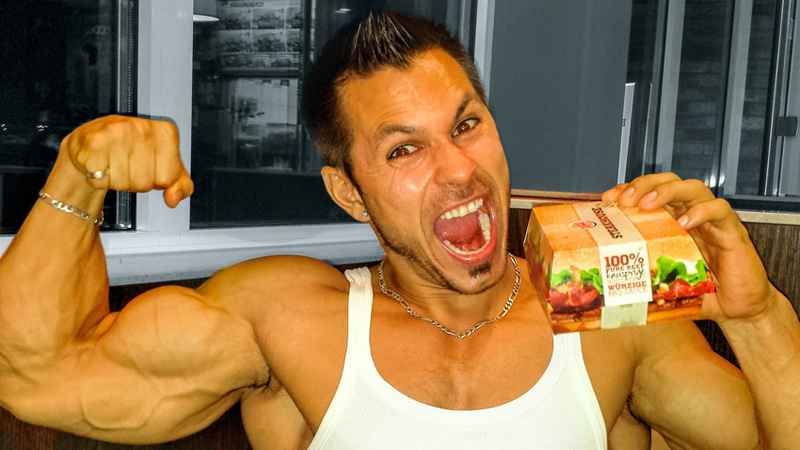 The last thing a bodybuilder would want is unhealthy and calorie loaded fast food. The Jack In The Box is the first choice amongst the bodybuilders when it comes to fast food. The Chicken Fajita Pita is high on the list of bodybuilders.It consists of a mere 302 calories while providing 23 grams proteins. Jack In The Box Chicken Teriyaki Bowl is a good meal that can be healthy indulgence after workout. It is equipped with 103 grams protein. Wendy’s is one place that specializes in non-vegetarian dishes, especially the chicken. The grilled sandwich chicken is the one you should go for. It comes with 36 grams protein and only around 300 calories.If you are ready to consume 130 more calories for the sake of 10 extra grams of protein, then you can go for Grilled Breast Fillet Sandwich. Subway is one of the prominent names in the world of fast food that also caters to bodybuilders. The 6” subs could be your best choice. You can go without chicken for this item as well, so it makes a preferably vegetarian dish. A combination of veggies, onions and peppers should bring a tasteful nutritional diet for you. No doubt, it will be a good supplement to your physical activities in the gym. Never count out KFC when it comes to nutritional items on their menu card. Go for the Tender Roast Sandwich where you can get 31 grams protein at the cost of 270 calories. But remember, you have to sacrifice the sauce for it. The second on the list is the Original Recipe Sandwich. Get 29 grams of protein for 320 calories for this item. For a purely vegetarian bodybuilder, it is essential for him to have a sufficient intake of fruits and vegetables. There is hardly any exception when it comes to consuming these types of eatables. Fruits and vegetables are a rich source of nutrients the body needs. The consumption of fruits and vegetables makes sure that the immune system remains strong and sound as it works as an antioxidant. Keep a daily intake of fruits and vegetables for better and faster results.